Who else is sick and tired of vomit, screams, and poop? …some days I’m just not feeling it, ya know? So today kinda sucked. You rose from your bed, ready to greet the world with a smile and OWN this mom thing. You were ready to kiss boo-boos, soothe cries, comb out that rats nest (finally), and be the mega of all moms. You ran out of bandaids around lunch and had to start using stickers. The baby cries you were so determined to soothe would. not. stop. and you’re not sure why. An attempt was made to comb out the ball-o-hair attached to your daughter’s scalp, but it was quickly abandoned because (let’s be honest here) you’re not going anywhere anyway. Now you’re staring at the wall without realizing it, wondering why in the world you were so excited to create these little minions in the first place. These are the days that I like to call “Not Suitable for Hallmark.” Evidently no one wants to buy “Sorry I Screamed at You” greeting cards. There is such a thing as a perfect parent. This parent never gets frustrated at their kids. This parent always knows exactly what to do. This parent regularly gets 8+ hours of glorious sleep every night. They are a lot more common than you may think. They are also EXTREMELY EASY to spot in a crowd. They’re the ones who don’t have any kids. Don’t let your mom-esteem lay in their hands, because *bending near and whispering* they will destroy you. Let your spouse, yourself, your baby, and God determine your mom-esteem. 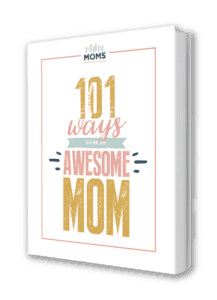 (Btw, if you’re feeling a bit insecure about your mothering, check out my free ebook called 101 Ways to Be an Awesome Mom. It’s true. You don’t have to “do all this” forever. You only have to do it through this particular season of life. You aren’t always going to be a 24-hour breastfeeding bar. You aren’t always going to have to be home by noon for naps. You aren’t always going to listen to those nightly witching-hour screams. Trust me, you won’t always feel like you have fuzzy green sweaters on your teeth. Regular showers and good hygiene is right around the corner. Promise. We were talking about all the struggles we’d had after childbirth (and when “Aunt Lucille” visits every month *wink*). From the often-overlooked emotionally-crippling postpartum anxiety to the frustrating existence of the postpartum pooch that stubbornly wants to stick around. Honestly, that conversation was a breath of fresh air. We all bathed in the emotions of that simple reminder: we aren’t crazy! As women, we were made with a super power. The power to understand the hidden emotional needs of our families. How do we managed to pick up on these unspoken signals from our children and husbands? Hormones. The magic elixir that makes us so freaking amazing at bonding and tender loving care-ing. Yes, hormones are awesome, but sometimes too much of a good thing can make us feel like Momzilla – ready to stomp the entire world into rubble just because we can. It was so refreshing to hear these women share their own struggles with the hormonal rodeo and know that I’m not alone in this. If you’ve been feeling a little alone in the craziness that is motherhood, let me assure you. You are not alone. Reach out with the rest of the Mighty Moms Club on Facebook or Instagram. Let us reassure you! It’s a theory that says that the smallest change in human history could drastically change the future. What if Paul Revere’s horse had thrown a shoe, and he never warned the Minutemen? What if the Titanic had missed that iceberg, and Rose and Jack spawned generations of French-painting artists? What if Hitler had had enough talent to stay in art school? What if JFK had chosen to ride in an closed car? Little things can make a big impact on history. Little things like the 12-pound bundle cuddled in your arms. The world is a different place, now that your baby has arrived. It will never be the same. Your child is a significant part of the world. The work he does…the relationships she fosters…all will change the course of history in some way. So don’t think for a minute that this time you’re spending, pouring into this loud messy little thing, is insignificant and wasted. This mothering thing you’re doing? It is a work set apart from all other work. The impact of this work will be felt hundreds of years into the future. So take a deep breath. It’s time to dive back into the fray. First off let me just say that I absolutely love your blog! You perfectly express what I’m feeling into words. This letter made me cry. As a first time mum of a high need baby I’ve had a rough ride. I started off motherhood on the wrong foot, with the first few weeks consisting of endless growth spurts, mastitis, and a stomach bug…one week after another. On top of that my poor 5 month old daughter suffers from reflux. It has only been in thr recent week that she has started napping lying down. My next quest is to actually venture out of the house without her attached to me for her sleeps. My heart comes in my throat when I think of it! By the way, I can totally relate to the furry teeth. What is a toothbrush, anyway? It keeps me going knowing that this will all get better soon and that time invested now will hopefully raise a happy child later. She is my world at the moment. It’s hard, but I wouldn’t have it any other way if it means having a contented child. Just so you know, I am from Australia and I have had more tears and bad hair days (literally) than I can count. Sorry to burst your bubble! You’re welcome to come in any case! God bless you for all your work and encouragement. Rebecca, I’m so thankful it encouraged you. We all have to stick together on these kinds of days… It will absolutely get better. The bad days of the future never quite look like the bad days of the past. But the same goes for the good days. With a preteen in the house, I’m learning to ride the roller coaster! I stumbled across this blog at the absolute perfect time, right when I needed it most. First time mommy here, feeling like some days I want to say, “okay, it’s been real, parenthood, but I’ve changed my mind about this whole mommy thing. I think I’ll click my heels three times now…” Your blogs makes me feel more sane and a lot less alone! Thank you for your honesty and candor. I too feel as though you’re speaking directly to me, friend to friend, and assuring me that I can indeed rock this, squirrel’s nest of a hair and all! Not all days are created equal, and bad days do not negate the good. And today, when I wasn’t sure if I would laugh or cry at the chaotic state of my life these days, your blog helped me laugh. You’re awesome! Thank you! So glad it could encourage you Megan! It’s true, we’re all in the same boat. It’s just as encouraging to me to read YOUR comments, even this blogger mom needs to hear others have not-so-awesome days too! mega hugs, friend! Hi Heather – I just wanted to say THANK YOU for what you’re doing here. I found your blog when I first brought my Toad home in December and I felt so comforted and encouraged, even on those very hard newborn days (or nights, who could tell). You have a way of writing that makes me feel like we’re chatting over coffee (or wine!). I can’t tell you how many times your posts have calmed my fears and made me realize that I CAN get through the tough parts. And they’re reminded me to really enjoy and be present during those blissful mommy-moments. My Toad is now 6 months and I come at least weekly – I’ve read, re-read and emailed every post. Thank you, keep it up, and God bless. Oh friend, you are so sweet! I’m sooooo thankful that you feel that way, because that’s exactly the picture I have in my head while I’m writing. I’m sitting at Starbucks at the moment with my ear buds in, and you are right next to me. *cheers* It’s encouraging to hear that I’m accomplishing my mission. Mega hugs for being so supportive and sharing these posts with your friends. It’s a little blog, but I’m hoping that with time it will grow to support more and more new parents!